On the show this week, John has a new story about how Starbucks failed him, Brian blew a bunch of money on protein bars, and this paleo diet food tastes like hot dogs. 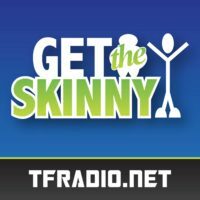 All that and more on the newest episode of Get the Skinny! On the newest Get the Skinny John and Brian discuss Chipotle’s free burrito offering, and Jack in the Box’s million burger giveaway. Brian also reflects on the Super Bowl and why it’s worse than Thanksgiving. Oh, and the guys chat about this year’s Super Bowl ads.